Painted Path: 13.1 Miles, Courage, Sprout Magazine and a "Getting Naked" Giveaway Winner! 13.1 Miles, Courage, Sprout Magazine and a "Getting Naked" Giveaway Winner! After running a half marathon yesterday (! ), I'm happily, comfortably resting/taking it super slow & easy this morning. Whew...running is not something that comes naturally to me so it feels like an extra big accomplishment to have run those 13.1 miles. 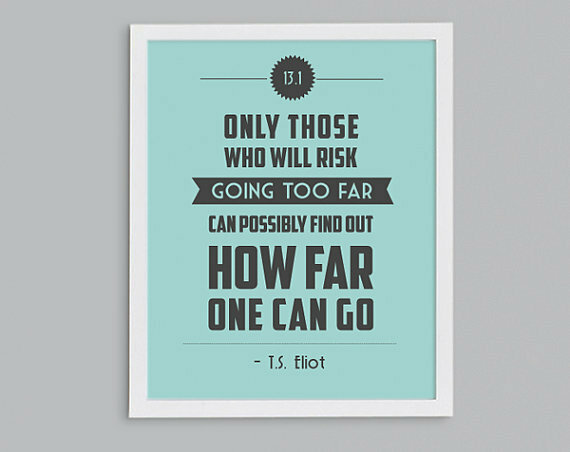 Even though I've run half marathons (and even one full marathon) in the past, each and every time I step out the door to run it feels like the hugest stretch, and each time I wonder if I'll possibly be able to meet whatever distance goal I've set for that particular run. Yesterday my intention was to run the whole time and to minimize the suffering. The half marathon I ran a couple of years ago was seriously grueling so the fact that I was able to run yesterday with very minimal suffering felt huge and so good! 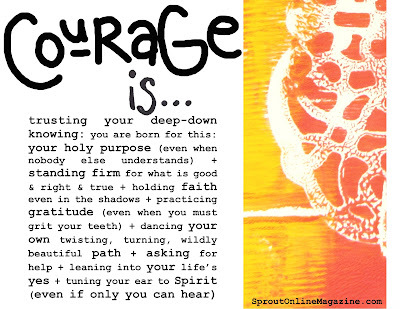 So, this morning I'm kicking back with some hot tea, reading this month's Sprout magazine, which happens to be all about courage (which couldn't be more timely for me with my Getting Naked class so close to starting). Christy, you have won a spot in my Getting Naked class (starting May 6th)! I'm so so excited that you will be joining me & the beauties that have already signed up! If you haven't already gotten this month's issue of Sprout online magazine (it's only $6.00! ), click HERE...there is so much beauty/color/comfort/connection/inspiration in this issue. (As well as a couple of lovely pages about my upcoming class). Amanda Fall is the creator of this incredibly inspiring magazine and is one of the most genuine, big-hearted people I have the honor of knowing. You are a divine spark. And courage? Your birthright. Within each of us burns a quiet fire: a radiance where vulnerability and strength meet, where toughness and tenderness ignite. Fan your flame with Sprout: Courage--sixty brilliantly colored pages of art, poetry, essays, and more. Join me (Amanda Fall) and sixteen guests in this passionate issue. Dance with us as we root ourselves in truth, looking and listening deeply to the core of our lives. We are Spirit-led and Grace-fed. We are hurt and we are healing. We are bright-eyed and bold-hearted (even when we feel anything but). We are united. And oh, sweet one, we are luminous. Jula, I'm beaming for you! So proud of you for running that marathon... and for running the marathon of creativity! Your class is going to be transformational--I just know it. So honored and happy to share a behind-the-scenes peek in this issue of Sprout magazine. Thank you, beautiful one. You make my life so much brighter. Ah, Amanda...what a treasure you are, my friend. Words can't express how grateful I am to have you here holding my hand. Thank you for your ongoing courage. I love who you are & how you See. Julia, I'm soooo impressed with you for running that marathon. Wow! It must feel so good. What an accomplishment! And now you are just days away from launching your "Getting Naked" classes. I believe that yesterday's triumph was a sign to you of the success awaiting you. I can't wait for the course to start. I feel the happy anticipation in my spirit. Dear Leah, every time I see you here, I light up. What a beautiful blessing you are in my life. Thank you for always being here with a wide open heart. I am excited-beyond-excited for this class to begin! I can already feel the energy of it & with you & all of the other beauties that have registered, it can't help but be transformative. So damn grateful for YOU just as you are. Thank you for blessing me. Hi, Julia . . . I've found my way here from Amanda's site . . . I have long loved your contributions to Sprout .. . and when I started inching my way through this month's delights in Sprout: Courage, I was stopped in my tracks at her interview with you. Your class sounds like just what Grace has provided for me in the next couple months of my life. I was going to wait till I got home to sign up--I've been away from home, with family, for the past 6 weeks. But I came across your $10 off offer, and that's right up my alley :). Howsomeever, I tried to register, paying as a PayPal guest, and got a message saying the site was having difficulties and to try later . . well, I don't have "later" right now :). I'm getting ready to leave Mississippi to fly home tomorrow, and into a snow storm in South Dakota where I live. So I likely will not be able to get back online to complete the discounted registration by Thursday (since I might be stuck in some airport somewhere.). So . . . is it possible to hold a spot for me, at the discounted rate, and I'll complete the transaction as soon as I am safely home? By the way, did you know Amanda was my precious daughter? isn't she a peach? She is one of God's best gifts to me . . .
Maureen...when I read these words: "She is one of God's best gifts to me" I teared up - oh, how that touched me. Amanda is such a shining light - I feel so blessed to have her in my life. I will absolutely hold your spot at the discounted rate. I am thrilled ! & so grateful that you will be joining us. How about this, when you get home safe & sound, just pop me an email at juliafeh@yahoo.com and I will send you the link for the discounted price. Safe travels, dear one. And so much love. I loved reading your interview in Sprout Magazine. You are and always have been an inspiration for me. You shine so bright. You are a true gift. Congratulations to Christy ~~ I know it’s going to be amazing for you! Dear Eydie, your words always touch me so deeply. Thank you, my friend, for so freely offering your love. You are truly a treasure.